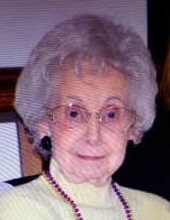 PEORIA--Virginia Mae Stever, 98, passed away peacefully on February 6, 2019, at Buehler Home in Peoria, with her loving son Shawn by her side. She was predeceased by her beloved husband Archie, son Terry, two sets of parents: Elmer and Mamie Kummer and William and Octavia Beckman, sisters Lucy Nation, Evelyn Fisher and Alice Madlinger. Born in West Frankfurt, IL on August 12, 1920, Virginia graduated from Manual High School and married Archie on May 11, 1946. Together they operated an A&W drive-in in Rantoul, IL from 1957-1977. Virginia had a sweet, gentle spirit and her faith, family and friends were most important to her. She is survived by her two children: Robyn (Ken) Farson, Shawn (Carol) Stever, grandchildren: Brian (Kim), April (David), Michele (Lance), Carrie (Eric) Jon (Katie) and great-grandchildren: Mackenzie, Carly, Brian, Jessica and Fiona. A visitation will be held at Wilton Mortuary, 2101 N. Knoxville Ave., Peoria, on Thursday February 21 from 5-8pm and Friday February 22 at 10am. Funeral Services will be at 11am, Friday, at the Wilton Mortuary, with burial at Swan Lake Cemetery immediately following. The Rev. Dr. Randy Williams will officiate. Memorials may be made to Glen Oak Christian Church, 1115 East Republic Street, Peoria, Illinois 61603 or Greater Peoria Honor Flight, P.O. Box 5072 Peoria, Illinois 61601-5072. Online condolences may be sent to the family at www.thewiltonmortuary.com. "Email Address" would like to share the life celebration of Virginia Mae Stever. Click on the "link" to go to share a favorite memory or leave a condolence message for the family.